Get started with AWS IoT by Tessel, which is an IoT device running Node.js See a simple example of how to set up and configure a device. AWS launched its IoT service at re:Invent 2015 and made it available for everyone in December 2015. I’ll show you how to get started with AWS IoT by using a thing, called Tessel, connected to the Internet during this article. AWS IoT allows you to build an IoT infrastructure and integrate with many other AWS services. Combine the following components of AWS IoT as needed to cover your requirements. Device Gateway: Enables things to communicate with AWS IoT. Message Broker: Provides a pub-sub system based on MQTT, WebSocket, or HTTP REST pub. Rules Engine: Routes messages to integrated services like S3, DynamoDB, and Lambda based on conditions. Security and Identity: Manages identity and access credentials for your things. Thing Registry: Organizes devices helping you to keep an overview of your fleet. Thing Shadow: Synchronizes device state between the device and the backend service. AWS IoT is a fully managed service, which means AWS is subject for operating the service with high availability and scalability. Accelerometer: Detect orientation and movement. Ambient: Meters sound and light intensity. Climate: Meters temperature and humidity. Infrared: Sends and detects infrared signals. Bluetooth LE: Communicates via Bluetooth Low Energie. Camera: Takes pictures and records video. Various community-created modules for even more flexibility and fun! 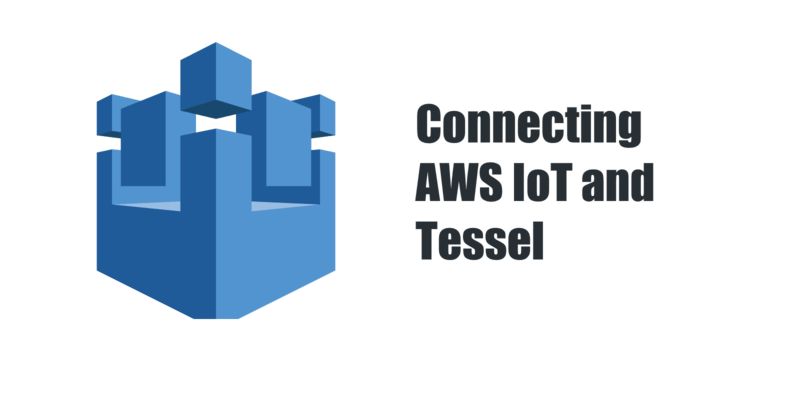 As you will see next, combining AWS IoT and a Tessel provides a flexible and easy-to-use IoT development environment. An excellent basis for a prototype or proof-of-concept. The following example guides you through setting up a temperature alert with Tessel and AWS IoT. The climate module is used to meter the temperature. The device will report a measuring point every minute. The following figure illustrates the setup. Log in to the AWS Management Console, select region N. Virginia, and switch to AWS IoT. Click on Create a Resource and select Create a Thing. Choose temperature-sensor as Name and click on Create. Select the newly created thing temperature-sensor and click on Connect a device. Select Node.js from the list of SDKs and click on Generate certificate and policy. Download the public key, the private key, and the certificate and click on Confirm and start connecting. Copy the shown configuration (JSON) and click on Return to Thing Detail. Connect to your Tessel by following Tessel Start. Connect the climate module to port A of your Tessel. Move the downloaded private key, certificate, and root certificate to the directory. Rename the private key to private.pem.key. Rename the certificate to certificate.pem.crt. Rename the root certificate to root-certificate.pem.crt. Copy the source code from below to a file named index.js. Copy the content from below to a file named .tesselinclude. Run t2 push index.js from your command line. Make sure setting your current working directory to the project directory. 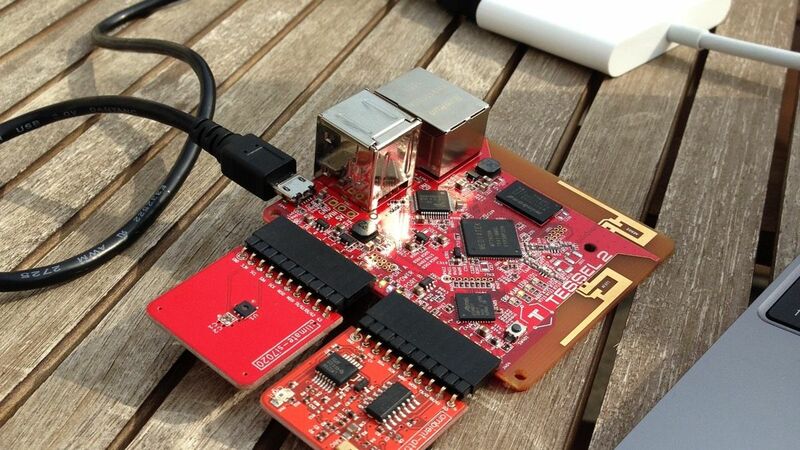 Your Tessel is now sending temperature measuring points to AWS IoT every minute. You deserve a short break. There is only one thing missing: Setting up an alert if the temperature increases a threshold value. Log into the AWS Management Console, select region N. Virginia, and switch to AWS SNS. Select Topics from the sub-navigation. Click on Create new topic. Enter temperature-alert as Topic name and click on Create topic. Open the details of the created topic by clicking on its ARN. Select Email as Protocol and insert your email address into Endpoint. Wait for an incoming mail from SNS and confirm the subscription by clicking on the provided link. Click on Create a Resource and select Create a Rule. Fill in temperature as Attribute and Topic filter. Insert temperature > 10 as condition. Select `Send message as a push notification (SNS) at Choose an action*. Select `temperature-alert at SNS target*. Fill in RAW as Message format. Click on Create a new role to create a new IAM role allowing the IoT rule to send messages to SNS. Type in temperature-alert as name and click on Create. Click on Create to create the IoT rule. You will receive an email whenever a temperature measurement point exceeds 10 degree Celsius. Adopt the condition in the IoT rule if you want to get alerted at another threshold value. Select Topics from the sub navigation. Pick the element named temperature-alert and click on Actions and choose Delete topics. Delete the IoT rule temperature. Deactivate the certificate and detach it from the policy and the thing. Delete the policy temperature-sensor-Policy and the thing temperature-sensor. Congratulations! You have successfully deployed your first IoT application on AWS. Watch out our blogs for more content about AWS IoT shortly!